Society's rules vanish...when trumped by power and wealth. Walk alongside Frank Leo, a former mob enforcer known as Frankie Flowers, thanks to an ever-present carnation in his lapel...a stand-up guy who can be your best friend or worst nightmare...Meet Mattie Matt, a career racketeer, who came up the hard way, while nurturing a life long dream which is now within his grasp and promises to change his life forever...Young Bessie Mae Purifoy, a southern girl, who flees New Orleans trying to outrun an evil curse placed on her family by persons unknown. She settles up north in hopes of embracing a new future...Marta de LaCosta, of Barcelona, Spain, arguably one of the most beautiful women in the world, admired or desired by those she meets, but her heart holds a haunting secret...TaNellie, the hustler with the lines and grace of a thoroughbred who runs his unique stable unlike any other. He must come to terms with the only thing standing in his way...himself. 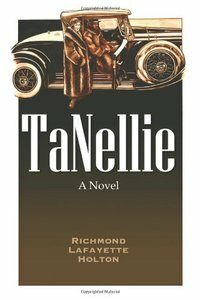 TaNellie is a deftly woven tapestry of America's fast life, whose threads begin during the depths of the Depression, causing generational repercussions. Richly characterized and tightly plotted, TaNellie will fascinate you until the last page is turned.